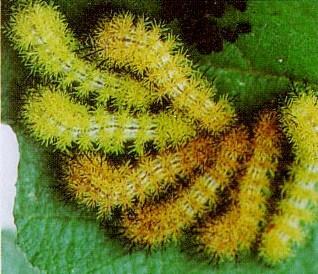 Region: This Caterpillar is found in eastern and central North America. Life cycle: This insect produces one generation each year and overwinters on the ground in a cocoon. Physical Description: This 3-inch long caterpillar is green with a wide pink stripe and thin white stripe. It also has many stiff, stinging hairs on its body. 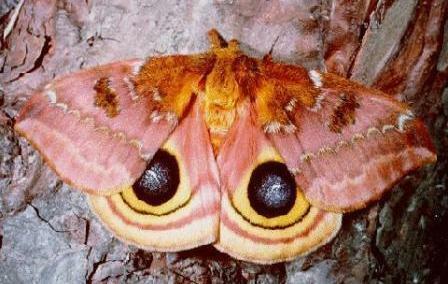 The adult moth is yellow or purplish with black spots that resemble eyes on each hind wing. It has very large feathery antennae, a hairy body, and a wingspan of 21/2 to 3 inches. The eggs are laid on the leaves and branches of the host plants. Feeding characteristics: This pest attacks apple, blackberry, corn, and current plants by chewing the foliage. Controls: This caterpillar rarely causes serious damage, so controls are not necessary. If the damage is intolerable, then remove the insects by hand, but don't use your bare hands - they have very irritating spines.